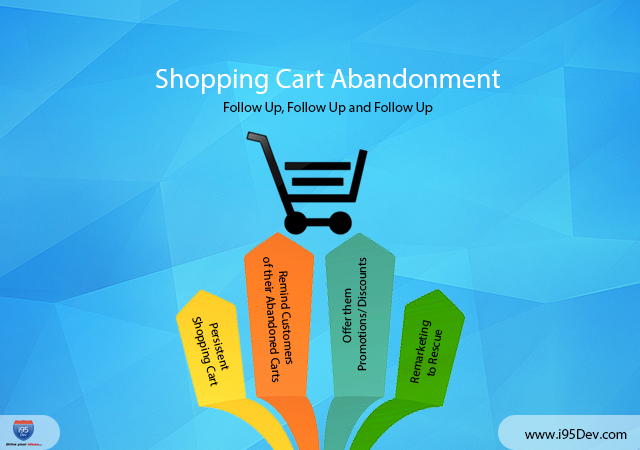 We have discussed shopping cart abandonment and the ways to reduce it in last 5 blogs. This blog, the final episode of the series, is based on how you better trace your customers and build a healthier customer-merchant relationship and convert abandoned shopping carts to successful orders for improved sales. Persistent shopping cart saves a customer’s cart contents across sessions through “persistent cookies” for future reference. It enables customers to add products to their shopping cart from their laptop at work, review or edit the shopping cart from their smartphone on their way home and finally complete the transaction on a tablet back at home; creating a seamless shopping experience across multiple devices. If users were to abandon or leave your website without making a purchase they will see their cart as is when they log in again. While some users might still decide to not go ahead with the purchase it can act as a good reminder and drive some sales. On the other hand your customers might find it too frustrating to find and add these products all over again. With various studies suggesting that more than 70% of shopping carts are abandoned, retargeting this huge customer base is crucial. It is unlikely that you will convince all these customers to convert, but you are bound to see some success. One tried and tested way to get these customers to convert is to send them an abandoned cart email encouraging them to come back and purchase. Researches show that 88% of online shoppers who abandon online purchase before completion are open to be emailed by retailers afterwards and 35% say that they will actively welcome it. Promotions/Discounts and Coupons have always allured customers and influenced them to purchase. Offer exclusive deals, coupons and promotions/discounts to encourage them to complete their purchase. We don’t recommend that you do this for every customer who abandons a shopping cart. In last few blogs we have seen that there are multiple reasons for cart abandonment and hence it is important to identify the reason and try various things to see which ones work. The latest on the card are the remarketing ad campaigns. Remarketing ad copies are the ad copies that are visible to your customers on other websites after they have visited your website (and executed a desired action). Remarketing ad campaigns can be dynamic and customized to include items that the user has looked for or added to the cart. Remarketing helps you reconnect with your customers by constantly reminding them of the products by showing relevant ads as they browse the web.